ORLANDO -- Hewlett-Packard today began taking orders for its first 3D printer, the HP Jet Fusion printer, which it said will be up to 10 times faster than existing machines and can cut the cost of manufacturing parts in half. At the RAPID 3D additive manufacturing conference here, HP revealed two models: the lower-cost and lower production 3200 series and the 4200 series, for which it is now taking orders. The 4200 series will begin shipping to manufacturers in October; the 3200 series will be available in mid-2017. HP originally unveiled its Jet Fusion printer in October 2014. HPs 4200 series Jet Fusion printer (left) and post processing station. HP claims its printer will enable mass production of parts through additive manufacturing (3D printing), instead of just rapid prototyping, for which the technology is typically used. The printers are unlikely to be used to produce millions or billions of production parts; think, instead, in terms of hundreds, thousands or tens of thousands of parts, HP said. The printers will also revolutionize 3D printing in that they will be able to print electronics in the parts they create through the use of conductive materials printed at the voxel level. Like a pixel in a display, a voxel in 3D printing is a tiny cube, millions of which make up a larger object. A single voxel is 50 microns in size. HP's Jet Fusion printers have a print area or a print bin of 16-in. x 12-in. x 16-in. Within that area, there are 2.4 teravoxels (a teravoxel is a trillion voxels). "So parts are fused together at a very small level -- almost at the molecular level, and that helps give them a spectacular strength," said Alex Monino, HP 3D printing marketing director. "Imagine the possibilities of this in world of the Internet of Things, where not only every product is connected but every part in every product connected." For example, Monino said, healthcare products such as orthotics or medical implants could have embedded wireless RFID chips that provide feedback to physicians or physical therapists on how well the product is performing or even how well a patient is doing. HP's Jet Fusion 3D printer can embed electronics in parts, so that not only can a part's performance be measured, but the effects of its surroundings can be measured, too. "Now, imagine the car of the future where every part is transmitting information," Monino said. "And, parts can be visibly or invisibly printed with ink that can only be seen with UV light, so you can print parts that ensure products cannot be counterfeited. The top of the HP Multi Jet Fusion 3D printer showing a print bar. It looks like a scanning bar on a typical 2D printer. The 3D print bar, however, has 30,000 nozzles spraying 350 million drops per second of thermoplastic or other materials. HP sells its printing materials in 30 liter boxes or 200 liter barrels. During post processing of printed objects, any unused powder materials is recycling for reuse. An HP 10-liter material cartridge. HP also sells 200-liter barrels of printing powder. Currently, HP's Jet Fusion printers only use nylon, although its technology roadmap includes other plastics, ceramics and possibly metals. "I believe that HP will disrupt the industry with a new level of speed, quality and cost," said Terry Wohlers, president and lead analyst with market research firm Wohlers Associates. "It's difficult to validate machine and part quality until customers are available. My experience with HP and HP products is that the company does not take it lightly." Like some other 3D printers, HP's is actually made up of printed parts. For example, of the 135 customer parts that make up a Jet Fusion printer, 66 were 3D printed by HP's own factory machines, according to Monino. 3D printing shines when it is used to produce an item that cannot be made with injection molding, CNC machines or other traditional manufacturing techniques, according to Pete Basiliere, imaging and print services vice president at research firm Gartner. The HP Jet Fusion 3D printer prints at the voxel (or pixel) level, meaning it can use any combination of colors to create an object. Examples of 3D printing in manufacturing abound, "ranging from medical implants and prostheses to MakieLab's' dolls. Align Technologies makes 150,000 Invisalign dental braces every day and every one of them requires a custom 3D-printed mold," Basiliere said. "Compared to high-volume manufacturing of the same part, there is a cross-over point at which it is cheaper to produce the part with traditional technology than with 3D printing," Basiliere continued. "Injection molding, for instance, has a cost curve that starts high (due to tooling costs) but declines as those and other costs are amortized over the long production run. 3D printing has essentially a horizontal cost curve since there are no tooling costs and make-ready cost is low." By enabling more productive 3D printing, HP is lowering the horizontal line for powder bed fusion costs, Basiliere said. About the size of two washing machines, the HP Jet Fusion printer line will have a starting price of about $130,000 for the 3200 series and in the low $200,000 range for the more sophisticated 4200 series. The 4200 series Jet Fusion printer is 25% faster than the 3200 series and will be able to produce product runs of more than 50,000, Monino said. Even at that rate, the printer will be more economical to run than traditional CNC milling or injection molding manufacturing techniques, Monino said. Once a print job is complete, the printed parts must be removed from the Jet Fusion powder bin and cleaned. Here an HP technician cleans a printed vehicle intake manifold. Along with the base printers, the HP Jet Fusion system comes with a separate post-processing station, which removes excess powder and debris and prepare printed parts for use. The post-processing stations are sold separately from the printers and add about $25,000 to the price. While technically dissimilar in some ways to binder jet or selective laser sintering (SLS), a method of binding pulverized material together with either chemicals or laser light, HP's Jet Fusion 3D does result in a similar post-processing requirements; printed parts must be allowed to cool and then be pulled from a bin or "cake" of powder and cleaned before used. Joe Kempton, an analyst for market research firm Canalys, said HP's Multi Jet Fusion technology is essentially powder bed fusion 3D printing. In addition to thermoplastics, HP will offer other materials with which to print, including ceramics. "Therefore, even though the technology is a game-changer, it will only affect a portion of the 3D printing industry, and within this segment, only the middle market of the enterprise space," Kempton said. "This means the kind of customers who will be using it are different from those who would be using, for example, [stereolithography]"
Stereolithography (SLA) is a 3D printing method where photosensitive resin is hardened with either UV or laser light. While various methods of SLA printing can be faster than others, HP's Multi Jet Fusion printing will top any previous production speeds. "HP is truly offering a revolutionary new type of 3D printing," Kempton said. "There is often a lot of overhype in the 3D printing market over new technologies, most of which fail to live up to these lofty expectations, but HP's Jet Fusion technology really is something special." 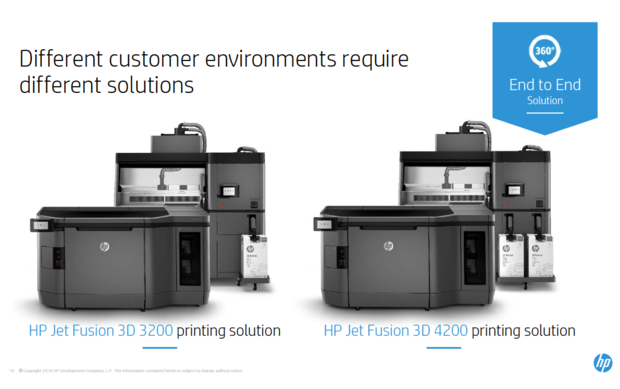 While special, HP's Jet Fusion 3D printing technology is not about to "change manufacturing as we know it," Kempton cautioned. The technology is still likely to be used mostly for rapid prototyping. But if it lives up to its speed and quality claims, HP is likely to become a dominant player in the 3D printing arena, Kempton said. Wohlers agreed, saying HP's printers will "rewrite the rules of 3D printing." 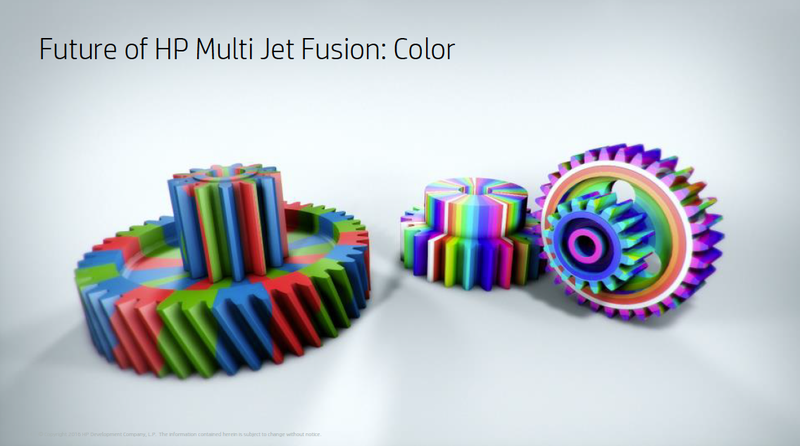 For one, HP's Jef Fusion printers operate at half the cost of similar 3D printing methods, such as laser sintering. Today, laser sintering is the most popular additive manufacturing process for production parts. Wohlers also pointed to HP's claim that its machines will be 10 times faster than laser sintering, since speed is critical to producing production quantities of parts. 3D printing has traditionally been faster at preparing parts for manufacturing, but slower in actually building the parts than traditional methods such as injection molds. "So for some parts, companies will choose to use the HP machine for tens of thousands of parts annually, rather than using plastic injection molding. Determining whether it is viable will depend on the size of the parts and the requirements of the material," Wohlers said. "The company also said that the material properties are consistently better than laser sintering and I have no reason to doubt this claim. It is going to shake up 3D printing in ways that we have not seen in the past." Chainmail printed by the HP Jet Fusion 3D printer. While revolutionary in some ways, HP's Fusion Jet printing technology does have its drawbacks, Wohlers said. For example, like laser sintering, parts must cool before being removed from the printer's powder bin. So if a part's build takes 10 hours, it could take another 10 hours before parts can be extracted for post processing. 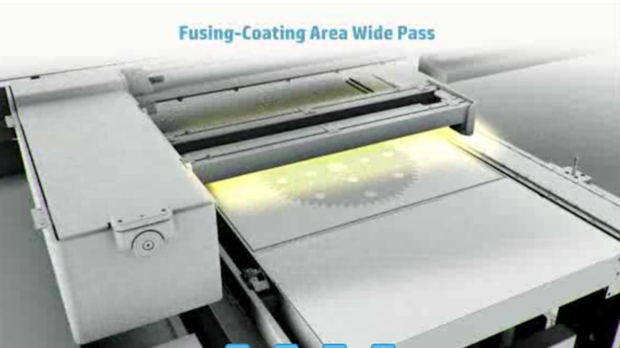 Additionally, HP has not released pricing for materials -- the powder for the Jet Fusion printers. If reasonably priced, it will be much more likely to attract manufacturers seeking to create large product runs with 3D printing. "The automotive industry will likely begin to manufacture some plastic parts using HP's machine, whereas it was too expensive by 3D printing previously due to their high quantities," Wohlers said. Ford Motor Co. has been using binder jetting and a half dozen other 3D printing methods -- such as fused deposition modeling (FDM) and stereo lithography (SLA) -- to create both prototypes and injection molds that can be used to make production parts. With traditional automotive manufacturing methods, an engineer would create a computer model of an intake manifold, for example, and wait about four months for one prototype at a cost of $500,000, according to Harold Sears, Ford's head of additive manufacturing. With 3D printing, Ford can print the same part in four days, including multiple iterations and with no tooling limits, for just $3,000. HP has been working with nearly a dozen companies, allowing them to test the Jet Fusion printing technology in its labs. HP has been allowing nearly a dozen companies to test the Jet Fusion printing technology in its labs. The companies include Nike, BMW, Johnson & Johnson, Jabil, Siemens, Materialise, Shapeways, Autodesk, and Protolabs. "For our future roadmap toward serial part production and personal customization, we see major potential in our partnership with HP to investigate this new kind of 3D printing technology at an early stage," Jens Ertel, head of BMW Group Additive Manufacturing Center, said in a statement.